Its great to have some some new exciting wines in the shop and having had the wines in the shop now for a week I am pleased with the way they are tasting and being received. 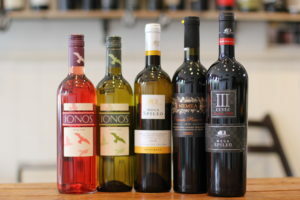 The range is good too, since I am now able to offer wines for as little as £8.50 for the Ionos White and Rose from Achaia, made from ancient Greek grapes, Roditis and a little Muscat and Syrah. The middle wine in the photo is a fragrant elderflower and Thyme dry Muscat, well worth the price tag of £11.95 then you have two reds, a 100% Agiorgitiko, a herbaceous, earthy and slightly bitter red, 2010 that needs a little time to get going but is another worthy cork opener at £13.75 then on the far right the Cuvee 111; a blend of Agiorgitiko, Mavrodafne and Cabernet, quite rich and with some ripe berry fruit but delicious with some big red meats, £14.70. 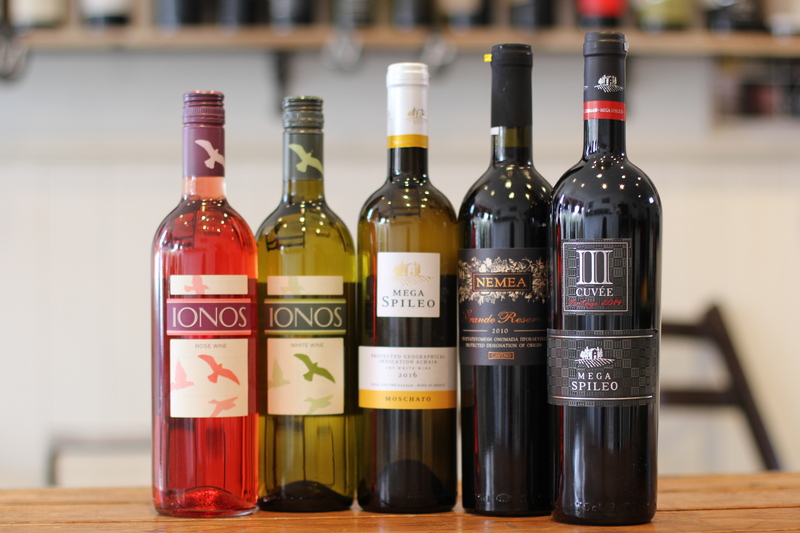 So do come in soon and give these Greek gods a whirl, they are well worth a splash out of the bottle and a whirl! Its a difficult choice to be honest since we have imported so many wines this last few weeks. However I shall keep the focus in August on Greece and focus on the Peloponnese wines and in particular the Ionos White from Cavino, a non vintage wine but at £8.50 a real bargain and easy and delicious to consume. Its tough nowadays to find wines at this price point that are easy to drink. By that I mean most wines at this price point you have a glass of and you in no way would care for another. That’s the simple objective with these wines, to simply create the desire to want more! The grapes for this wine is Roditis, an ancient grape that dates back to the 1st Century. Its a citrus rich grape, very limey with a hint of chalkiness and a little Muscat that fills it out a little and adds some weight and fragrance. Its the perfect accompaniment to shellfish and classic pan fried fish for example. I urge you to come into the shop in the coming weeks and taste it. At the whirly wine shop you can actually taste a great deal of wines before you buy them, guaranteeing that you, the customer are not wasting your money! Not many wine shops offer that do they, the supermarkets certainly don’t, so come on in an taste before you buy! Hoping to see you at the whirly wine shop, 22 Ritherdon Road, SW17 8QD soon but be warned the shop is closed a great deal between 10-22nd August so look at the shop hour post on this site to check when I am open. The bottle is second from the left with the forest green label.